French workers are at it again, striking for what seems like the umpteenth time over their latest perceived government slight. This time, their frustrations are based on the the seemingly inadequate response by their president to their dwindling pensions. While many previous strikes have been secular, this time the strike was a joint national effort by those in both the public and private sector. 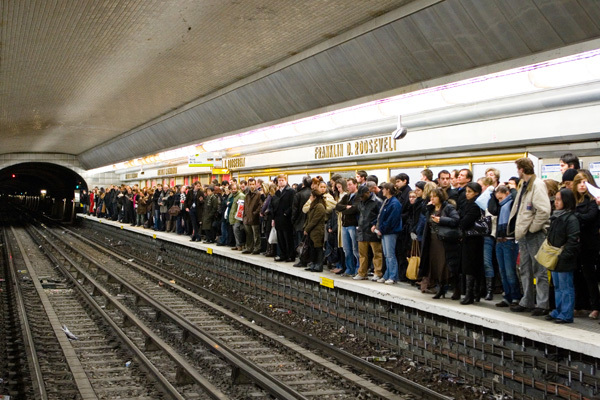 The inter-city trains have been hit hardest, leaving Parisians (and visitors) struggling to make their way through the city. The biggest consequence that a visitor to Paris might experience right now, however, is a less frequent (and more crowded) bus and metro system. 1) If you can, select a hotel near the center of Paris. The closer you are to the center, the easier it will be to walk to the sites you want to see. Prices might be slightly higher, but at this time of year, hotels are far from full, so you should feel free to negotiate a rate for your room. It's not uncommon to be able to get a room for 10 - 20% lower than a published price. 2) Since you can't rely on taking the normally efficient metro to get to your hotel, try taking the shuttle that Air France provides. It leaves every 15 minutes and takes about a 35 minutes to reach the city center. Be warned, however, that it makes limited stops and you will have to walk to reach your hotel from the whatever drop off point is closest. 3) If you prefer to have door-to-door access directly to your hotel, consider booking a Paris Shuttle that will leave you right at your hotel. Prices for a shuttle are usually equivalent to those of a taxi, but the shuttles are larger and more comfortable, and since your booking is confirmed ahead of time so you won't have to wait at a taxi stand at CDG. Also, your fair for the shuttle is predetermined so you won't have to worry about any exorbitant taxi prices due to traffic issues. 4) Give yourself extra time to catch reach your destinations! That means, head to a taxi stand even earlier than you would plan to make sure you arrive at the airport in time to catch your return flight home. The taxis that are available will be in heavy demand. And, with the metro not operating fully, more Parisians will be forced to drive to their jobs - further congesting a city that is already infamous for its traffic jams. Finally, take it all in stride when you're there. The French have a very strong view of citizen rights, and consider it their responsibility to protest any sort of government infraction. While it may lead to some minor inconveniences, think of the romance of it all. Striking is very much a part of French culture. For better or for worse.